Seychelles had made its way to our bucketlist after seeing pictures of Anse Source D’Argent, one of the most photographed beaches in the world. However, getting to this pristine island country from Mumbai was a challenge until early 2015. With at least one lay over, reaching Mahe, the largest island of the Seychelles archipelago, would have taken a day and cost us over USD 1000 per person for a return trip. Now, things are different! Seychelles is much more accessible now. Air Seychelles connects Mumbai to Mahe by a direct flight which has a flying time of ~5 hours. If you plan a couple of months in advance, you can get the ticket for as low as ~USD 475! 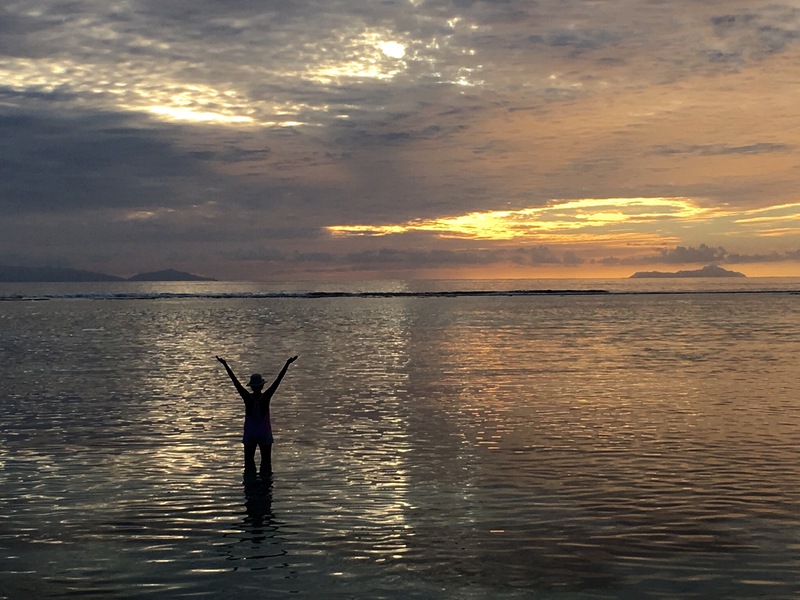 We visited Seychelles in November 2015 for a week, thanks to the superb connectivity. Without a doubt, our choice was to fly Air Seychelles, which has Etihad Airways as a partner, putting us more at ease. 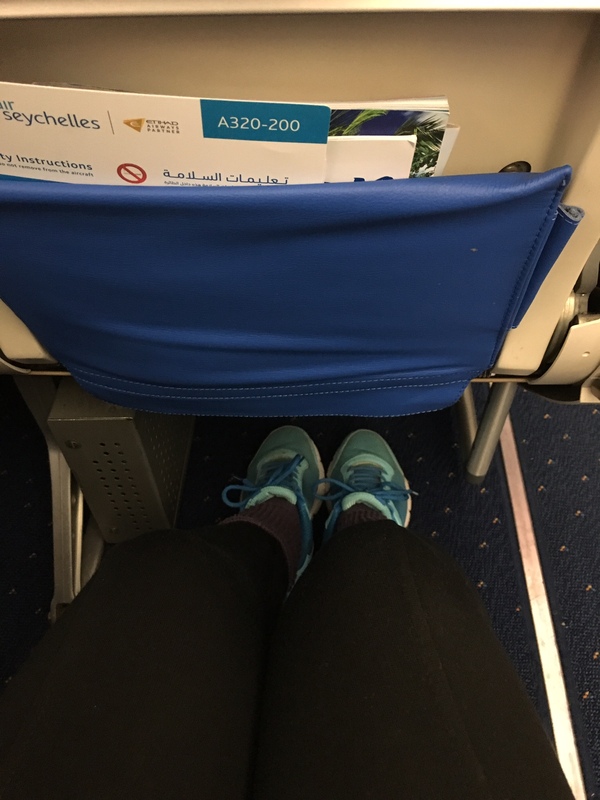 For all those who have been wanting to set foot on the pristine islands of the Seychelles, here is a first hand review of economy class in Air Seychelles…. Its easy to book your flight on the Air Seychelles website. The search engine provides a snapshot of the prices for the entire week, thus helping you choose the most economical option. Seats can be chosen while making the booking online …a must do to ensure that you get to sit with your spouse on your honeymoon! As of now, Air Seychelles’ systems do not support web check in. However, things are about to change to a new technical platform which will allow web check in post March 2016. The plane was named ‘Silhouette’ after one of islands in the archipelago…perfect start to the vacation! 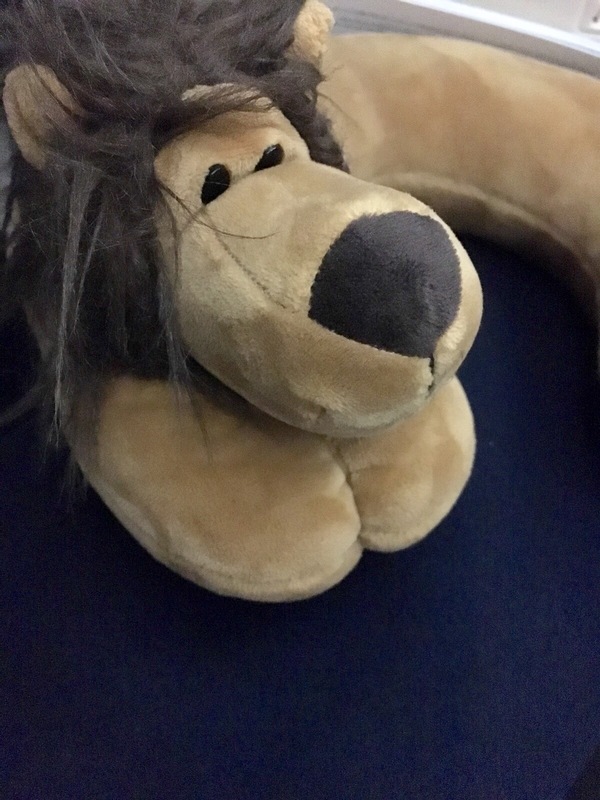 The aircraft had clean interiors with comfortable seating and plenty of legroom.The seats in the economy class had enough leg room to let me stretch my legs and catch some shut eye. The business class had a 2X2 seating and the economy class had a 3X3 seating. We were pleasantly surprised with the space in the overhead compartments. There were no oversized bags stuffed into the space and there was plenty of room to keep our DSLR bag. 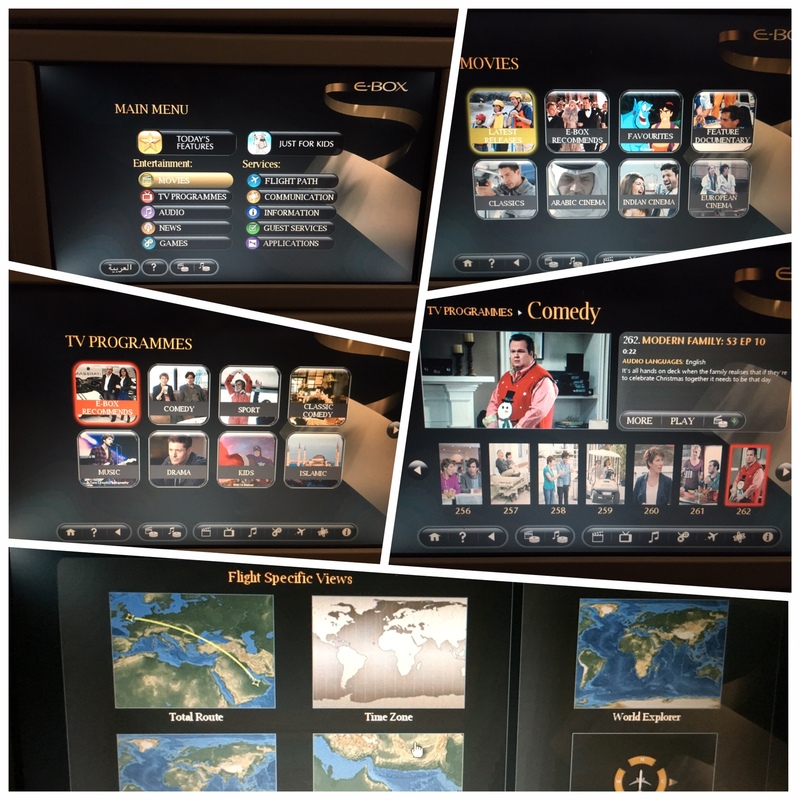 The flight had an entertainment system with popular movies, TV shows, cartoons for kids etc. I was happy to see that there were a few episodes of The Big Bang Theory and The Modern Family…. sitcoms that I watch at home. Ankur was busy surfing the movie titles. Considering that we haven’t been able to watch many recent movies, he had plenty of options to choose from the well stocked movie llibrary – Hindi as well as English…even Arabic! Entertainment options…Big Bang Theory and The Modren Family….means happy me! New head phones were there on our seats as we made way into the craft. We plonked ourself, plugged in the head sets and were happy to be entertained by the glowing screen for a couple of hours, before we drifted into dreamland. 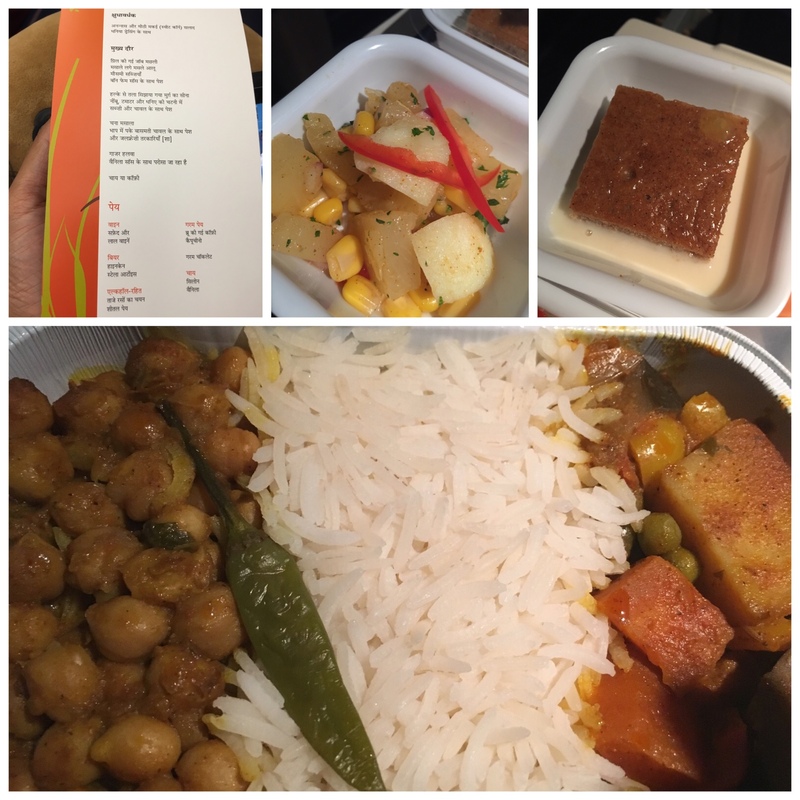 Usually, Ankur and I have our fill before we board as we are never too sure on whether we would like the in-flight meals or not…. and a lot of times, we end up eating only the salad and fruit from our meals. The food on the Air Seychelles flight was fresh and tasty. The menu was available in English and in Hindi… loved that touch! We had breakfast on our flight from Mumbai to Mahe and dinner on the way back. On both occasions, food was great. The portion size was adequate and we were ‘happy full’ after our meals. Ankur loved the Creole omelette for breakfast and I throughly enjoyed the carrot cake with custard as dessert after my dinner. For those who like their spirits, alcoholic beverages were very much available. Ankur had a glass of white wine while I stuck to tomato juice with some lemon. Don’t miss the menu …in Hindi! 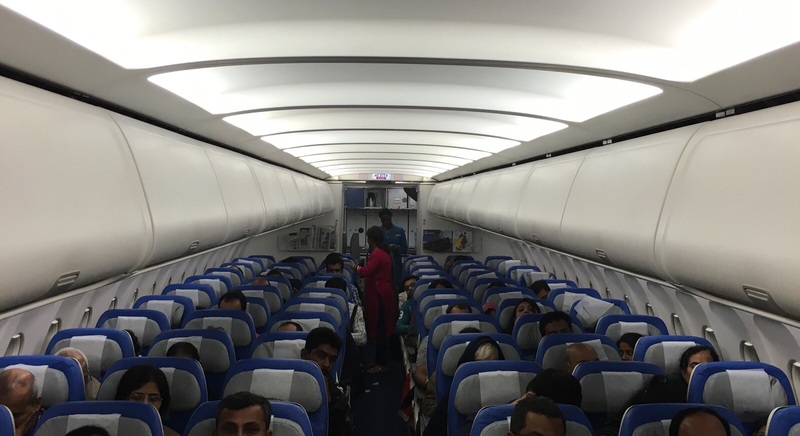 We boarded the flight from Mumbai at 500 hrs, which left on time. The flight landed at 800 hrs in Mahe. We had the whole day to us to ourselves…to stretch on the beach, unwind and let the vacation mood kick in. We typically like flights that let us travel at night and have the next day at the destination…time well utilized! On our return journey, from Mahe to Mumbai, our flight was delayed by about fours hours due to a technical issue in the craft that needed some investigation. While none of us desire a delayed flight, knowing that the issue was being addressed made us feel comfortable. Food coupons were offered at the Mahe airport, which were enough to buy a sandwich and a coffee…a thoughtful gesture. In-flight service was good and with a smile. At all points in time, we felt safe and the captain was communicative on the weather conditions, which was much appreciated. Safety is a top concern in air travel these days and we felt that we were taken care very well. However, our experience of flying with Air Seychelles would have been elevated by a notch if the ground staff team at Mahe would have been a little more empathetic when the Mahe – Mumbai flight was delayed and anxious travellers wanted to know the reason for the same. Also, on our return journey, we were put on non-reclining seats. We would have appreciated if we were told that the seats were non reclining, especially considering that we were spending the night in the flight. While we took a boat from Mahe to Praslin this time, we intend to use Air Seychelles’ domestic services to Praslin and other islands when we return to Seychelles. 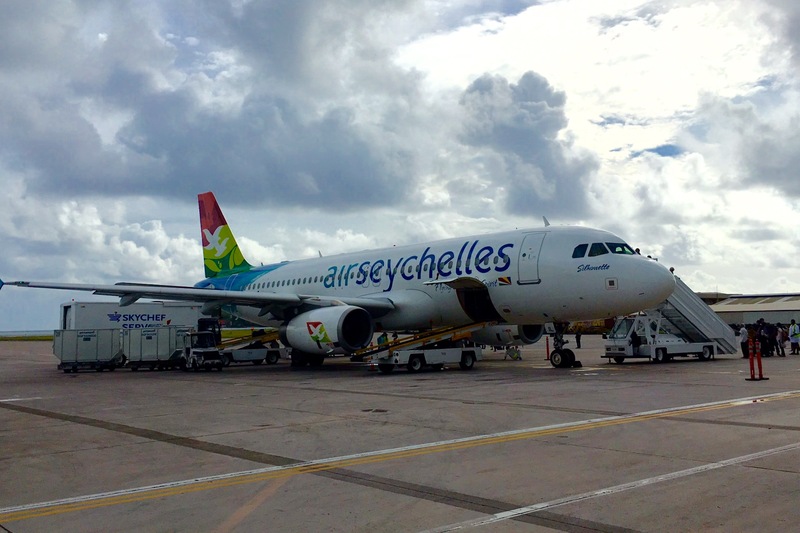 We would surely fly Air Seychelles again…whether it is a trip back to Seychelles….or to Mauritius ….or to Madagascar! We would give it a thumbs up for safety standards, in flight service & comfort and food. Hop on board to Mahe and tick Seychelles off your bucketlist! Many thanks to Air Seychelles for flying us on the Mumbai-Mahe-Mumbai route. As always, our views are independent and our own. Thanks for the review SONIA. Food is great:) Keep doing more reviews.